It’s been a few weeks since I’ve done a review and i am so excited to get in to this one. I do have to mention that i did actually get sent this concealer along with loads of other goodies from seventeen (you can see my haul here) but in no way does this alter my opinion. 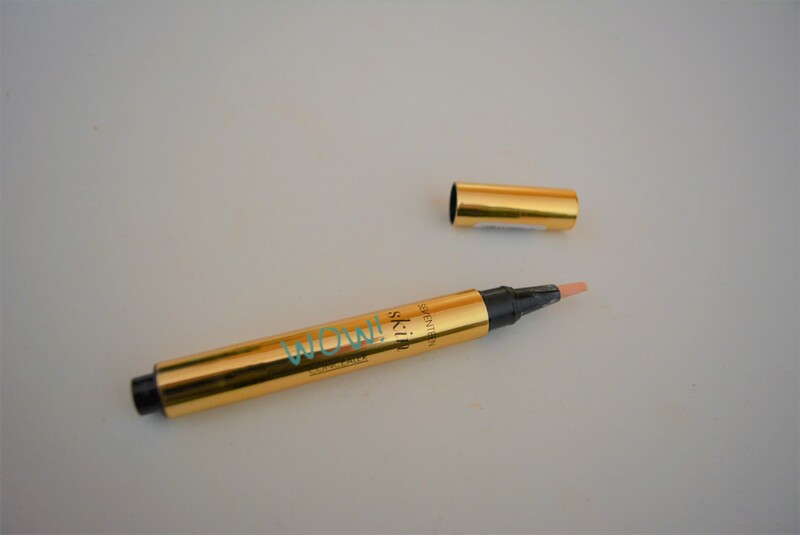 If you’re familiar with my blog at all you will know that my go to, absolute must concealer is the rimmel hide the blemish and so i was apprehensive about using this concealer, i didn’t want anything to replace my ‘bae’ (sorry not sorry). The packaging of this concealer reminds me a lot of the YSL ‘Touche Eclat’ packaging, in fact it’s awfully similar. I actually really like the similarity and considering how much cheaper it is, i thought this was wonderful. However, even if it didn’t remind me of YSL, the shiny gold packaging, just makes it look a whole lot more expensive than it actually is. I got the concealer in the shade ‘fair‘ and although sometimes this can be too yellow toned for me, surprisingly it was a really nice pale shade that complimented my skin tone. The whole ‘pen’ concept was also so different to me, as was using a liquid concealer rather than just a ‘stick’ one like i use. At first i wasn’t really getting anything when i clicked the end of the pen and thought perhaps there was a trick to it, fortunately after some clicking a small amount of the liquid seeped out on to the bristles and i applied it to my face. Something i loved was how much a little bit of the concealer went, a tiny amount covered under my eyes and really blended well in to the other makeup i was wearing. Usually i can pick off quite a lot of stuff i don’t like about a product but, i did actually struggle with this one. The main thing i wasn’t sold on was its coverage. The concealer looks great under eyes, highlighting brows and even as part of a contour routine but, covering up a spot on my chin, it just began to flake after a few hours. I feel like i need to apply quite a lot of product to really cover up a spot and even then i worry about it looking like a deformity in a few hours time. However, the product doesn’t actually state it’s to be used to cover up blemishes, it’s meant to brighten parts of your face like your brows, cheekbones and cupids bow. Therefore although a lot of us use concealer for all of these things plus a few pimples, it doesn’t actually state it can do that on its packaging. I also don’t like that i can’t see how much is left inside, this is such a small, stupid thing but i really like see through bottles or one clear line running through the bottle, just to give me a little indication on how much i have left. I feel like one day i will be left clicking for dear life and no concealer will make its way out. Overall, i actually love this concealer. It’s not the best at covering spots but it does an amazing job at brightening up your face and as long as you aren’t covering up a pimple, it doesn’t flake or wear off during the day. I am not that keen on clicking the product out, i am usually in a rush and like to get things done as quick as possible and sometimes it can be 4-5 clicks before any product comes out however, when it does come out, the waiting is worth it as it blends beautifully and instalty brightens you up. I would a million per cent recommend this to people who will use it for anything but pimples, i will a million per cent buy it again (Whenever that may be). Thank you so much for seventeen for sending it over!